Ferrari 488 Spider Performance, Engine, Ride, Handling | What Car? One of the few criticisms aimed at the Spider's coupé sister, the 488 GTB, is that it doesn’t sound as good as the 458 Italia it replaced. Well, that isn't such an issue here. It's partly down to the fact you can drop the roof or lower the rear screen so there’s less of a barrier between you and the engine. 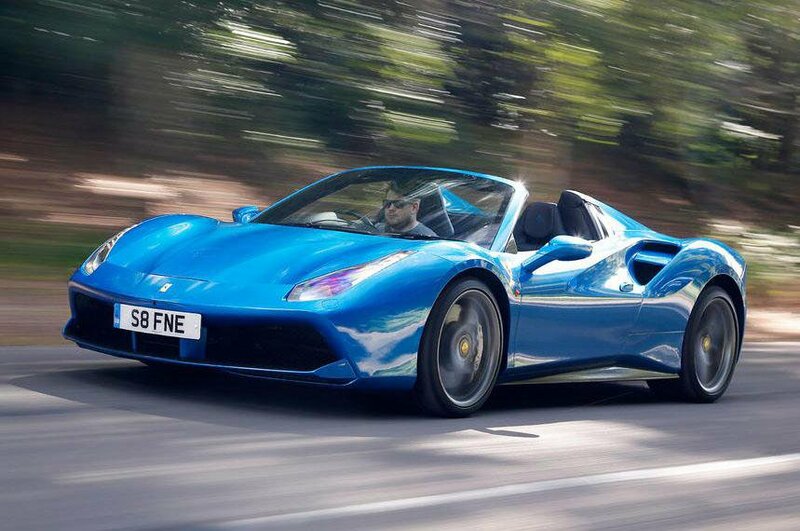 However, our test car was fitted with an optional titanium exhaust, too, which makes the 488 Spider sounds like a V8 Ferrari should, even when the roof is up. The engine fires into life with a suitably dramatic bark, and it howls addictively when you put your foot down. 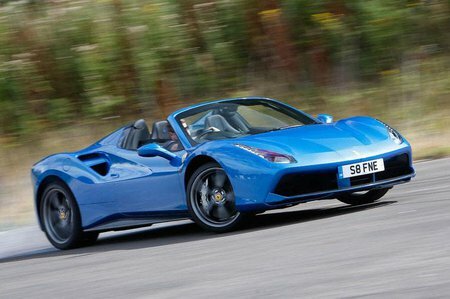 At the same time, the 488 Spider mimics the GTB in the way it builds speed; acceleration is ferocious yet progressive. There’s virtually no delay between you depressing the accelerator and the car responding, and while the engine pulls strongly from low revs, it also loves to be pushed to the redline – something that's rarely the case with a turbocharged engine. Ferrari’s Side Slip Angle Control system is standard, subtly intervening to help the car turn into bends and then helping you stay in control once it has. The result is a car that flatters the driver, capable of making Kim Kardashian feel like Kimi Räikkönen, although the steering won’t be to all tastes; it’s incredibly quick to respond, even by supercar standards, which can be quite draining when you’re in less of a hurry. In addition, the loss of the fixed roof has resulted in the 488 Spider feeling less stiff than the GTB, with larger bumps and potholes sending shudders through the steering wheel. As a result you can’t always place it with the precision that you can the GTB, or indeed a McLaren 650S Spider. Overall, though, the Ferrari 488 Spider is still a thrilling car to drive, plus it rides bumps a lot better than you’d expect and keeps wind buffeting to a minimum when the roof is down but the side windows up. It’s surprisingly easy to live with for such a focused machine.